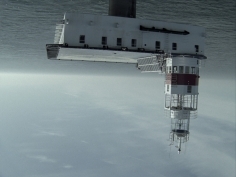 Galerie Lelong is proud to present the U.S. debut of British artist Catherine Yass’s new film Lighthouse (2011), a dynamic portrait of the Royal Sovereign lighthouse located off the coast of East Sussex, England. 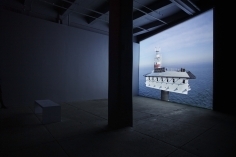 The single large-scale projection offsets the sense of equilibrium as the camera circles, soars, plunges, and hovers over the anomalous structure set in the vast expanse of sea and endless horizon. 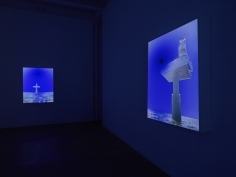 Complementing the film are a series of atmospheric lightboxes depicting the lighthouse and its surroundings. 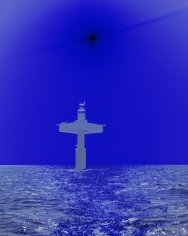 Lighthouse is Yass’s second solo exhibition at Galerie Lelong and will open to the public on Friday, February 3rd from 6 to 8pm. The artist will be present. Equally captivating and alluring, Yass’s series of surreal lightboxes draw the viewer into abstracted images of the structure. In this new lightbox series, Yass continues her signature technique of laying a photographic color transparency over a blue negative transparency, taken about 5 seconds apart. 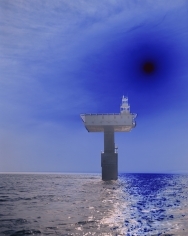 As a result, the areas that reflect light come out in vivid blue and the intensity of the sun is shifted to black, as seen in Lighthouse (East), 2011. The line between reality and illusion is blurred, giving the works a disturbingly calm and powerful presence. 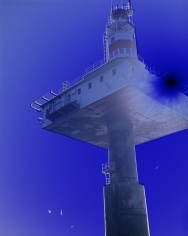 Lighthouse is Yass’s first major film since High Wire (2008) and joins the ranks of her other critically-acclaimed films, Lock (2006) and Descent (2002). In each of these works, Yass’s focuses on a well-known structure and explores both the physical and psychological effects of architectural space. 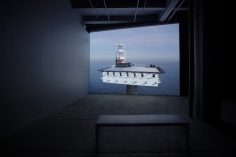 Yass first became fascinated with the Royal Sovereign lighthouse while visiting the De La Warr Pavilion, and thus, chose it as the subject of the film commissioned in conjunction with her mid-career retrospective there in 2011. 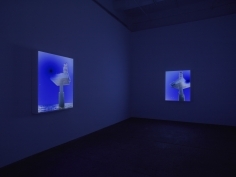 In addition to Yass’s recent retrospective at De La Warr, other major solo exhibitions include The China Series at the Stedelijk-Hertogenbosch Museum, The Netherlands in 2009; Descent at the Saint Louis Art Museum in 2009; and High Wire commissioned by Artangel and Glasgow International Festival and exhibited widely internationally in 2008. Yass was shortlisted for the Turner Prize in 2002, and has exhibited in international exhibitions such as the Shanghai Biennale in 2006 and the Indian Triennale in 2001. Her works are in numerous public collections including the Tate Collection, London; The Jewish Museum, New York; and The Scottish National Gallery of Modern Art, Edinburgh. Yass lives and works in London, where she was born in 1963. 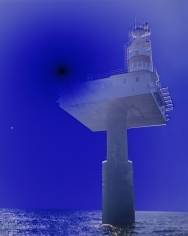 Lighthouse was commissioned by De La Warr Pavilion, Bexhill-on-Sea, East Sussex, and was produced with Funding from Arts Council England, Alison Jacques Gallery and Galerie Lelong. 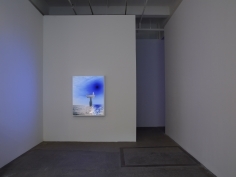 The exhibition will also be shown at Alison Jacques Gallery, London, January 13 – February 11, 2012.